Here's a sarcastic and amusing excerpt from a letter which Shadal sent to Yehash dated January 14, 1840. "I heard about, but did not understand the reason, for translating into English Rapoport's essay on the Ten Tribes. Perhaps they sent a communique from across the Sambatyon River, which is undoubtedly under British dominion. Then "from beyond the rivers of Ethiopia shall they bring My suppliants, even the daughter of My dispersed" (Zeph. 3:10), a great offering to the wonderful Ga'on [i.e., Shir], and request that he come with them and become their chief. When this news reaches you, my friend, write me! Then I will immediately send you a wonderful poem which I will compose in his honor. The Sambatyonites will hear it and rejoice. My heart swells with the great joy which I will feel when the Gaon goes to the Land of the Ten Tribes and he will find countless precious books; manuscripts written by Ibn Ezra while he was eating matzah, which reached the custodianship of the men of Ethiopia. But woe is me! What have I seen? A god is rising from the earth! An old man arises, and he dons a cloak - without a doubt it's Rabbenu Saadiah - with the Ten Tribes at hand, and he is shooting arrows through Ibn Ezra and Rapoport's heart (2 Sam. 28:14), since I brought them ill repute, saying that the mathematics of our ancestors were inexact. But the opposite is the case! It is a law from Moses on Sinai." Whoa. What gives? This letter is from Shadal's Angry Period. As you can see, he is mocking the idea that an essay of Shir might be translated to English, that is, the importance of this essay and of Shir's antiquarian research altogether. Shadal and Shir, BFFs, had a major falling out. It is nice to see how as soon as he gets mad at him, the man becomes worthless. Mind you, the essay he refers to was published in Bikure Haitim in the 1820s. It was those essays which impressed Shadal in the first place and caused him to make contact with him. So, the man was touchy, but his hurt certainly manifested itself in a clever way. Interestingly, 1838 a book appeared in Ofen called Haroeh. This was a journal published by a group of four young friends, disciples of Nachman Krochmal, who decided to take on the elder maskilim and expose flaws in their scholarship. In the second volume (link), dedicated to attacking both Shadal and Shir, the latter is actually taken to task for casting aspersions on the truth of the legend of Sambatyon (pg. 62): במאמרו על דבר היהודים החפשים העיר בהערתו ספקות רבות ע"ד נהר סמבטיון והחליט שאין אמת בהספור ממנו ע"ש והנה מלבד שהדברים האלה לא לו המה. "In his essay on the Free Arabian Jews in the footnotes he raises many doubts about the river Sambation and concludes that it is not true." 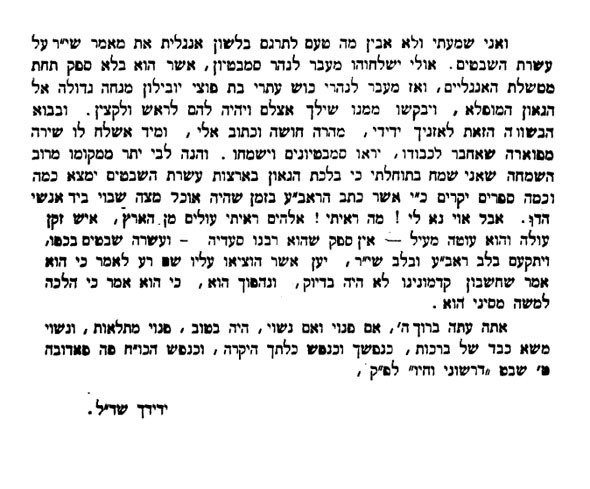 The author of this piece, Nachman Yitzchak Fishman, goes on to note that Eisenmenger brings many of these things - implying that Rapoport plagiarized from this notorious antisemite - and and in any case it is inappropriate for a Jewish scholar to cast doubt upon this matter openly before all the Jewish public, for much evil can come from this if it were revealed to the Jewish masses! Note that in the 19th century (and the 20th; future post) there were Jews who were very much involved and invested in the Sambatyon idea. 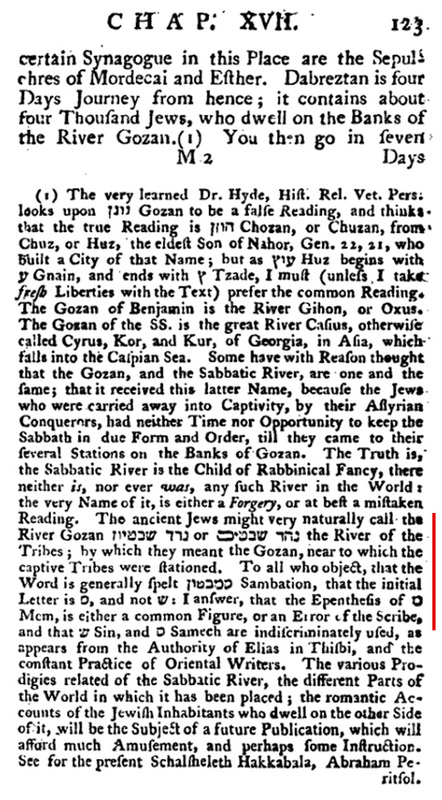 Speaking of Sambatyon, here is an interesting footnote concerning the name of this river from an 1783 English edition of The Travels of Rabbi Benjamin of Tudela. A. Asher writes in his 1840 edition that Gerrans "understood very little if any thing of hebrew, and that all his learning was derived from B. Arias Montanus, L'Emperuer and Barratier." He even claimed not to have seen Baratier's edition before printing the first chapter of his own! On Baratier, a Christian child prodigy/ iluy, see here and here. Remember, Baratier was 12 years old when his scholarly, annotated translation of Masaaos Rabbi Binyamin appeared. When in Lunel, Rabbi Benjamin writes in his Masaaos, about people he met: והוא חכם הגדול בתלמוד והרב רבי משה גיסו ורבי שמואל החזן ורבי שלמה הכהן. Gerrans translates this as "This man is well skilled in the Talmudic writings. Here you likewise meet with that great R. Moses Gisso and R. Samuel (Hhasan) R. Salomon the Priest." גיסו of course means "his brother-in-law". Then in the footnote Gerrans gives a whole speech about how this רבי שלמה הכהן was Rashi, but "This is one of Benjamins Errors in Chronology, for רשי was dead long before." Asher says there are almost as many errors as words in the passage, and that Gerrans 'explains' in the footnote that חזן means "sometimes a reader and sometimes an executioner." He then lists 5 separate mistakes Gerrans made about Rashi, and what arrogance he has to attribute his own error to Rabbi Benjamin himself! And of course this one line is a but a sampler of the whole book. Much more to say about searches for Sambatyon. For starters, see Mevaseret Tziyon, published by Eliakim Carmoly in 1841. Read, e.g., the letter that "messengers of the scholars of the Ashkenazim in Eretz Yisrael sent to the Bene Moshe and the Ten Tribes." It is dated Rosh Chodesh Marcheshvan 5691/ 1831 and signed by R. Yisrael of Shklov, author of Pe'as Ha-shulchan, among others (link). Iggerot Shadal V. I. pp. 656 - 59. "The next volume of notes will contain the papers by the Revd. Rabbi Rapaport, Mr. S. Munk and Mr. Lebrecht, which from circumstances over which I had no control, it was impossible to introduce into the present volume, although I allude to them." Unfortunately there never was a third volume! However, the essay which he had translated was על דבר יהודים חפשים הנמצאים בארץ ערב ("On the Tribes of Free Jews in Arabia") which appeared in Bikkure Haittim 4 (Vienna 5584/ 1823). This is probably a reference to Ibn Ezra's comment that he was imprisoned in India and he and the other prisoners were fed something similar to matzah, thus Shadal means "obscure Ibn Ezra manuscripts written by him while imprisoned in India." My thanks to Dan Klein who pointed this out to me. Thanks for the acknowledgement, S. Just to fill in the picture a little more, the odd little reference to Ibn Ezra's matzah eating is apparently not derived from any extant writing by Ibn Ezra himself, but from a story related by Abudraham, to the effect that Ibn Ezra had once been imprisoned in India and testified that prisoners there were fed matzah, which was satisfying in small amounts because it was slow to digest. Apparently there is some doubt that Ibn Ezra, well-traveled as he was, ever actually reached India. Such doubt, combined with Shadal's general antipathy to Ibn Ezra, makes his little aside doubly or triply sarcastic. Thanks. I didn't really get the chance to revisit that part of the story. It is, of course, a bitter joke altogether. Just wait for the Sambatyon conference being planned for August 2013! What I find interesting is, that the מהרץ חיות and שיר had the same story. They went from being BFF to arch enemies. Except that Shadal and Shir later reconciled. In Ptolemy's Geography a people named Sambatae are recalled by the banks of the Lower Zab Riber whioch was known locally as the Sabbatus. The name Sambation is found as a personal name amongst pagan Greek settlers at the mouth of the Don River. Eldad HaDani and others appear to identify the Don River with the Sambation. How's that for a logical inference? Is that a hurdy gurdy? What do you think this 'haskama' is about? Jimi Hendrix's long lost Yekkishe ancestor?